With mothers day fast approaching, I wanted to make a special clementine and pomegranate cake! I have adapted this recipe from Loraine Pascale’s recipe featured in the recent ‘You’ Magazine. Happy Mothers Day to all the fabulous mums out there! 1. Preheat the oven to 180° C (fan 160° C/350° F/gas mark 4) and line the baking tin with baking paper. 2. Put the clementines in a large pan, cover with water and bring to the boil. Reduce the heat, then cover with a lid and simmer for at least 45 minutes until the clementines are very soft. 3. Let the clementines cool down and then put them into the blitzer and blend until they form a smooth paste and put to one side. 4. Put the butter and sugar in a large bowl and whisk until fluffy, then add the honey and beat together. Add two of the eggs and the almond flour until it has been mixed well. Then add the other egg with the coconut flour, baking powder, cinnamon and self raising flour and whisk. Finally add the clementine paste, the yoghurt, the pomegranate seeds and juice (leave some seeds for the topping) and whisk until all has been combined. 5. Plop the mixture into the lined tin and cover loosely with foil. Bake in oven for 55 to 60 mins. Check cake is cooked with a cake tester. 6. 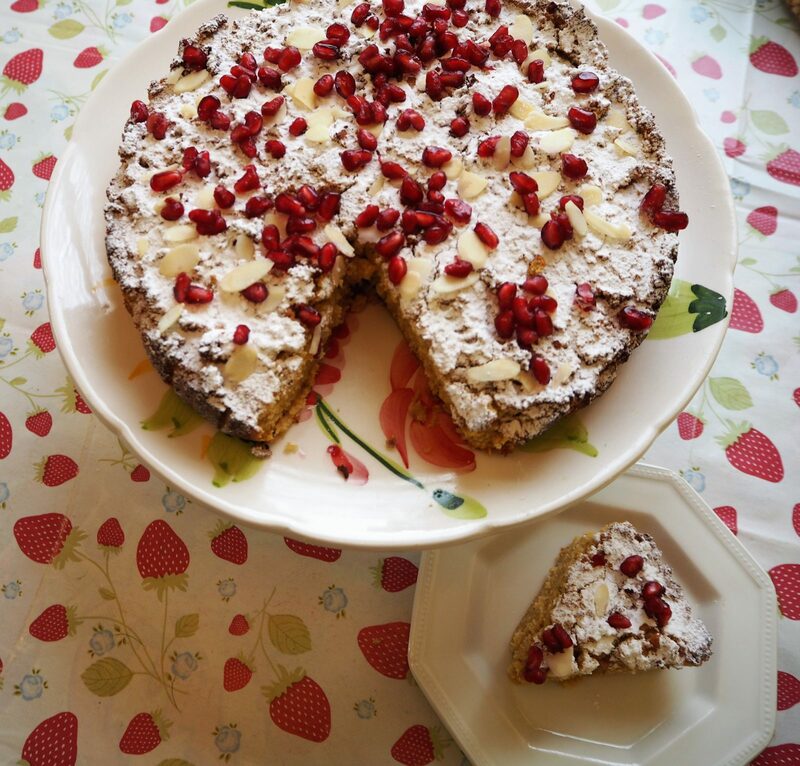 Once cake is cool, dust with icing sugar, flaked almonds and the pomegranate seeds.